“Anyone who will only take a look at our system layout sporadically, may need a bit of time at first to get their head around it,” says Jürgen Röck of the development trend. Röck is involved in the management of the divisions, Maintenance Buildings & Equipment as well as Energy Supply at Gardena Manufacturing GmbH in Heuchlingen, Germany. As part of the Business Unit OEM/EPB (External Parts Business), the company in Heuchlingen manufactures plastic parts with part weights ranging from 0.1 to 8500 g – both for the in-house program of garden equipment manufacturing as well as for external customers. 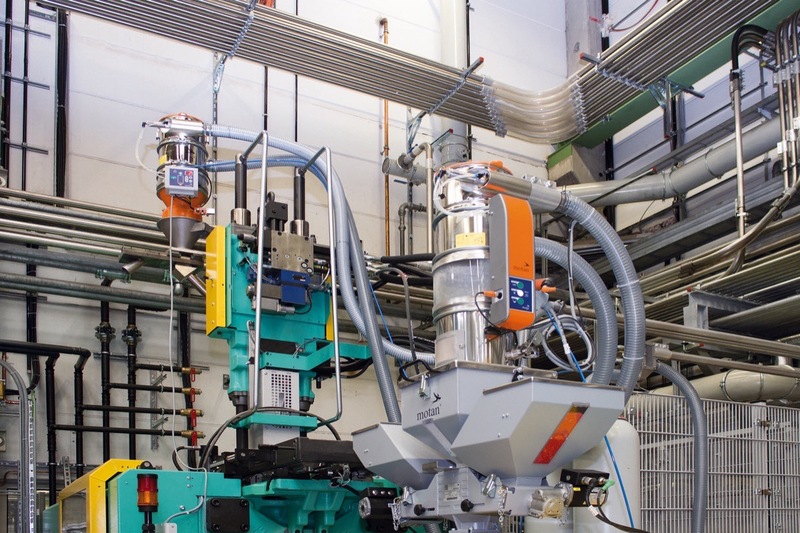 The plant is currently equipped with approximately 100 injection molding machines, which are capable of clamping forces ranging from 150 to 20,000 kN and process around 11,000 t of plastics annually – round the clock, seven days a week. The vacuum, which is required for the material transport process, is supplied to the majority of the conveyor systems in Gardena through a permanent central vacuum system. An advantage of this set-up is that simultaneous transport can be carried out by several hopper loaders at the same time, thereby achieving higher delivery capacities. Four pumps, each with a connected load of 22 kW, are installed for the permanent central vacuum system. Of the four pumps, an average of two pumps are running under normal operating conditions. The control system ensures that the pump running times as well as the operating hours are evenly distributed. In addition, there is also a conventional multiple-point conveyor system (line vacuum) equipped with a 5.5 kW pump. The ravages of time – and the increased processing of glass-fiber reinforced plastics – have already been taking its toll on the material feed lines as well as the vacuum lines for a long time. A “shot-through” arc is easy to find, since the material is expelled or “shoots out” from there. However, before this can happen, leakages may arise and these must be counterbalanced by higher pumping capacity. An interesting point is that the wear and tear not only occurs in the material feed lines, but also in the vacuum lines. The cause for this effect is attributable to the dust contained in glass-fiber reinforced material, before the dust can be eliminated in the central filtering system. The installation of a central drying system at Gardena was carried out by motan-colortronic in the course of a previous, comprehensive modernisation process. For this purpose, four Luxor dry-air dryer units form a supply network and supply several drying hoppers with dry air via a collecting line. 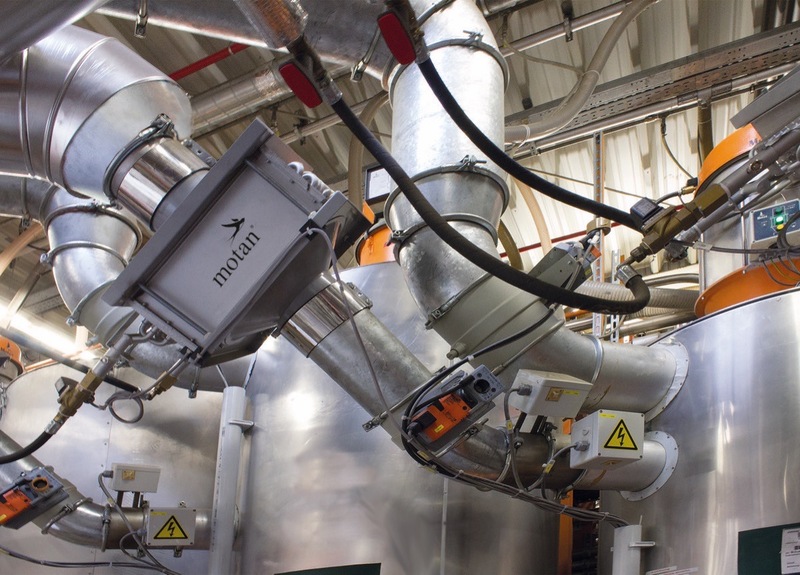 The dry air is supplied via the four interconnected dryer units, which are monitored and regulated by a central control system. During the process, the air output varies according to the individual requirements of the facility, which may range between 0 and 4800 m3/h. The dryers are equipped with speed-controlled process air fans. In addition, they are automatically switched on and off in accordance with demands. Control of the process air is carried out through the ETA plus system, which analyses and controls both the individual process air requirements of each drying hopper as well as the overall requirements. Through this process, each drying hopper receives only as much energy as is necessary to achieve and maintain the required material conditions. In line with a combined heat and power station (CHP), which was already planned in the past, an additional interface in the heating circuit of the drying system was implemented in order to achieve further energy savings. 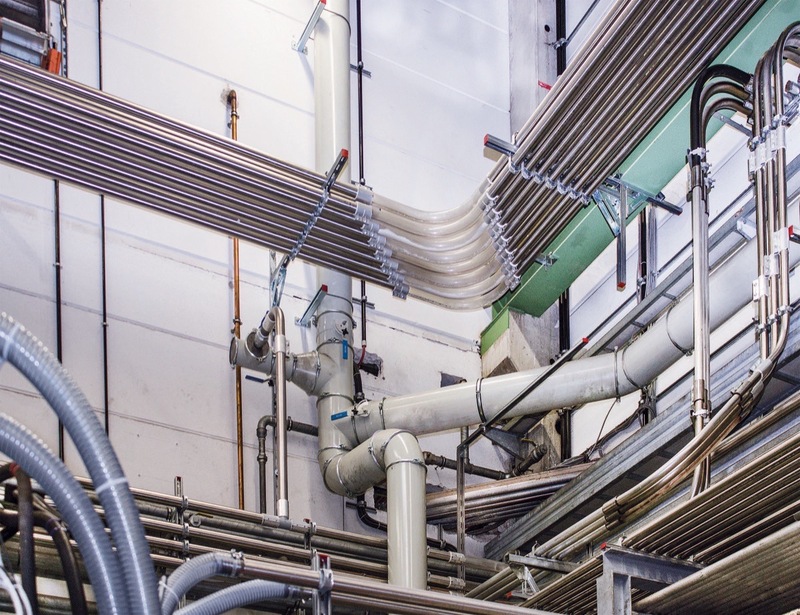 In order to take advantage of the heat, the company also constructed a sophisticated hot water network in the production facility. The drying system was likewise connected to it during the last stage of the modernisation process. The drying hoppers are now connected with this in-house district heating network via the air-water-heat exchanger. Carrying this out during ongoing operation proved to be a major challenge during the last stage of modernisation. In total, 2500 m of stainless steel pipelines and several hundred arcs made of glass and hardened stainless steel were to be laid and installed. 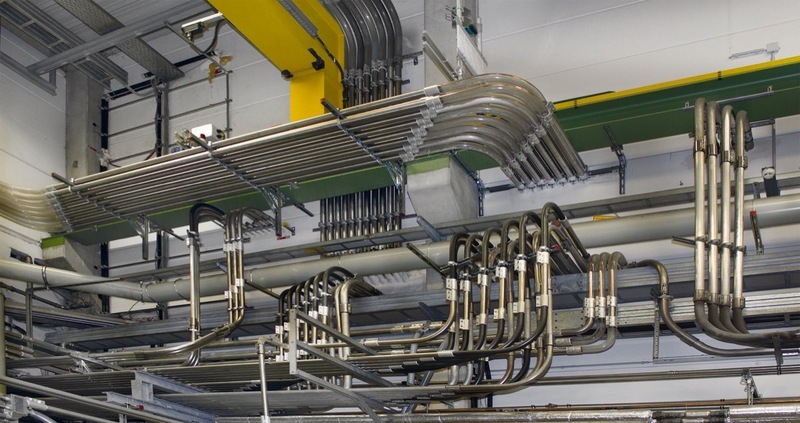 At the same time, an expansion of the permanent central vacuum system should be carried out in order to facilitate the connection of other machines to the system. The project was coordinated and realised by motan-colortronic. Depending on the tasks, three to six fitters were assigned to be present on the construction site. Production shutdown lasting for approximately a week was required only in the case of the expansion of the central vacuum system as well as the connection of additional machines. Numerous shut-off valves were installed at strategically important points in order to be prepared for future expansion measures at the central vacuum system. This will facilitate a better separation of the individual areas of the vacuum in the future without impairing the overall production process. The project was thoroughly planned as part of the preparation process. The pipes came as six-meter long bars and were cut to size on site. Everything else also came as standard products, such as clutches, arcs and hoses, which were likewise cut to size. This made it easy for the fitters to carry out the replacement of the pipelines. Through the process, the material is transported to the appropriate machine through a sophisticated “redirection system”. Conversion to the new pipelines is facilitated after the installation of each new pipeline. Therefore, the affected machine is stopped only for a short time, if at all. An admittedly quite challenging time window of seven weeks was planned for the entire modification process. In the end, the process took eight weeks to complete. The jobs were carried out by a motan-colortronic assembly team, which was already employed for many years at Gardena and well-acquainted with the relevant production process. Gardena has been working together with motan-colortronic since 1990. Therefore, it is not by chance that several generations of motan-equipment may be found in the Gardena production facility.